Independence Blue Cross (IBC) has been serving the health insurance needs of southeastern Pennsylvania and Philadelphia for over 75 years. IBC is an independent licensee of the Blue Cross and Blue Shield Association. Independence Blue Cross of Pennsylvania offers a range of excellent and affordable plan choices for individuals and families, small businesses and large groups, students, and Medicare supplemental products for seniors. IBC’s Affordable Care Act (ACA) health insurance plans are available both on and off the state exchange with access to an extensive network of doctors, hospitals and health care providers not only in Pennsylvania but nationwide. To check out the available plans offered by Independence Blue Cross (IBC), run an instant quote below. IBC offers 13 unique HMO and PPO individual and family health insurance coverage options that all provide the ACA--qualified 10 essential benefits. Select coverage with pediatric, dental, and vision options and prescription drug benefits (varying by plan). Health savings account (HSA) plans are also available. Bronze plans work best for those looking to keep premiums low, while not expecting to incur frequent medical charges toward the higher deductible. Lower premiums result in higher out-of-pocket costs, making these plans attractive for healthy adults or those who seek infrequent health care services. 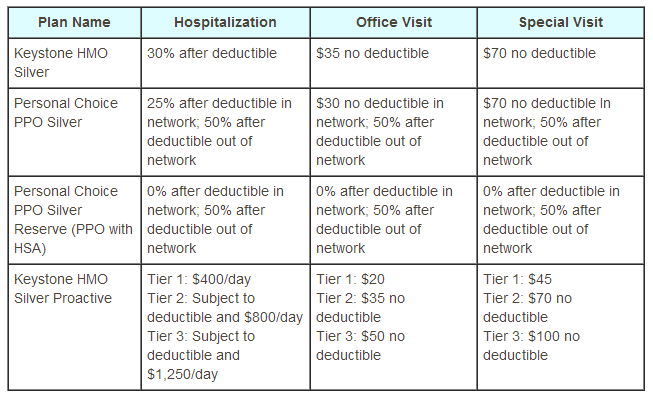 When qualifying for ACA cost-sharing subsidies, you’re required to choose a silver plan to benefit from these discounts. Standard premium subsidies can also be applied to silver plans, which typically offer an economical balance between your monthly premiums and cost-sharing. Silver plans are designed to work with cost-sharing subsidies under the ACA. Gold health plans offer a high level of coverage across three plans, including Keystone HMO Gold, Personal Choice® PPO Gold, and Keystone HMO Gold Proactive (IBC’s more affordable tiered HMO network. Gold plans offer a high level of coverage while keeping cost-sharing low. Platinum plans work best for those who frequently use a lot of health care services. Although platinum plans have the highest monthly premium compared to the gold, silver or bronze plans, they also offer the lowest out-of-pocket cost for covered medical services. Catastrophic plans work well for those who qualify for an exemption due to extreme financial hardship. Young adults under the age of 30 can select a catastrophic plan to satisfy ACA requirements. Catastrophic plans have lower monthly premiums than gold plans, but can result in higher deductibles with lower premiums. For this reason, they are a popular choice among young, healthy adults. Independence Blue Cross promotes health and wellness services for its members by offering exclusive access and discounts to programs designed to help improve and maintain overall health. $150 cash back for tobacco cessation programs, approved weight loss programs and gym fees. Get assistance from a Health Coach for health-related questions and concerns. Use the WebMD® tools to keep track of your health’s progress. Instant quotes are available, as well as immediate assistance by calling your HSA for America Personal Benefits Manager today at 800-913-0172.